This is the true story of how I became a Harry Potter villain. Yeah. Riddle me this: Why did I think a cape would be a good idea? Alas, I cannot say. I was excited for it, even. When it arrived this afternoon, I tore open the package with glee & discovered... a glorified Snuggie. With a toggle clasp & a hood & no armholes. I mean, it's just as advertised - a legitimate, bona fide, superhero-style cape - but because I'm not a lovely, leggy model, it doesn't exaaaactly look on me like it does in the site photo. Yes, I know: Duh. But I think Nathan really got it right when he asked me: "So, what time are you meeting up with the other Death Eaters?" Oooh, I really do love the jewelry that you picked out. 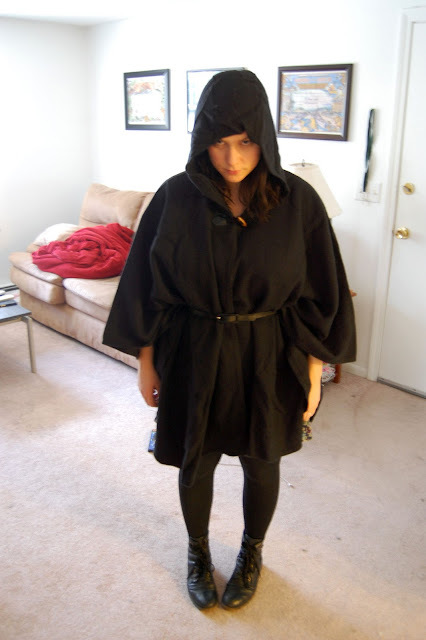 As for the cape, definitely useful to have for a Halloween costume. :P I don't think I could pull off wearing that normally. I laughed so hard at this post I snorted. Fabulous. And totally villain. The model can't even carry that off. I love, love love those earrings, but the cape would look ridiculous on me, and i also have no idea how i'd wear it! I like your shoes better. So adorable. This totally makes me giggle! Now you have something to wear to the release of the final Harry Potter movie! Also? The earrings are divine. I'm really glad you posted this. I'm cracking up at those cape pictures! omg! i Love this post! you sound just like me when i bought this awesome superhero-type half mask, i was SO excited, then once i got it i was like, "hmmm...what now?" hahahahahahahahahahahhahahah x 10. Love your facial expression! You could also totally be in Lord of the Rings or Star Wars...wow, Rob has totally nerded me out lol. Jewelry is super cute! OMG WE NEED TO BE REAL LIFE FRIENDS. Also, you might be my most favorite person ever. Nathan? Close second with that commentary. Oh that evil look is expertly evil! Maybe you can get a movie deal out of this. I personally like the Death Eater pic more than the leggy model. Also your cape-wearing photos above are adorable and I love that you are spinning around. That seems like the most appropriate cape maneuver to me. And THIS is why you're my favorite blogger in the land. Dude, I would wear that cape, AND JUST THAT CAPE, every day when I got home from work. "Caping" would be a new life-verb that meant hanging out on my bed eating ice cream and Netflix instant streaming while in a cape. So basically: SO JEALOUS. Lady, you are crazy...in a good way! I actually quite love my cape/coat and I am now going to play super villain with it. So thank you. Talked to Jeanne today & she lol at your caped crusader picture - she loved it! Ahahaa, oh my god, YES! I totally read this last week, but my laughs are like new today.